... hi, does anyone know if crown is screwed ? Crown not screwed down. Which may I say makes hand winding much less of a chore than with a screwed crown. Screwed down crowns arn't really necessary except on serious divers watches like the Trident 600 series. It is a very nice watch but I think the hands are incongruent - the gmt hand looks to be plastic and the hour and minute hands steel. I think this design is familiar but modern, but I can't recall similar watches around. This has potential to be an iconic CW watch. Wow! Great looking watch! The only thing id change is I would switch to modern lume for the hands ans marker. Otherwise, killer looking watch! Love it. 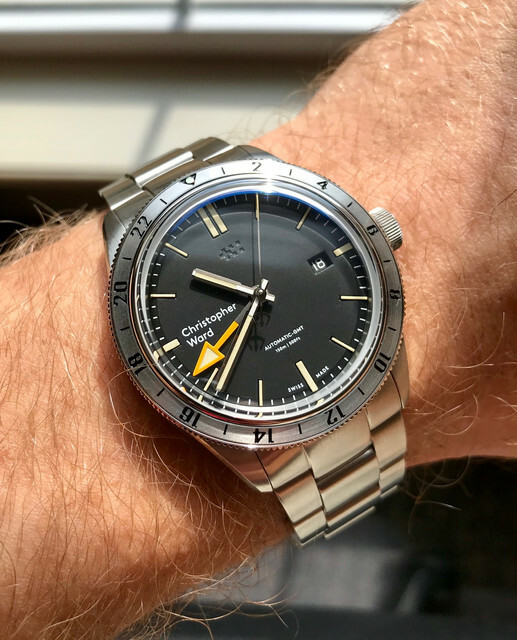 The slightly oversized gmt hand is a cool design feature. Deserves to be a classic. True, I just think with the C65 at over £900 for the bracelet option the Steinhart represents better value for money, not that the CW isn't a lovely looking watch. I'm bias but the Steinhart doesn't look nearly as refined as the C65 and at 14mm thick, quite a bit taller than the C65. It's the height of the steinhart (among many other design ques) that ruin it for me. 14mm is a thick watch. Great photos and I agree and based upon your photos I would also prefer the CW, it's just the balance between a significant difference in price. It's a stunning watch but just under a £1000 is a lot to pay, but it looks fab I agree. ^^^ True the RRP is quite a bit higher but not near what I paid and the quality was worth it IMO. There is always a discount code floating around (150cw18 if it still works) along with no VAT in the US brought it to about 650 GBP. CW did themselves a disservice however because this checked all the boxes and now I’m not sure I’ll need another watch lol. The design is the Rolex Explorer with the Steinhart a closer homage and as you say a fair bit cheaper. As worn by Steve McQueen of course.